I have several config files in my .net applications which I would like to merge application settings elements etc. I was about to begin doing it manually as I usually do, however thought there must be an XML diff GUI tool available somewhere. The tool would be able to go to the element level to compare and display the differences etc. However Google gave no substantive free tool results and no hints for anything of value. Is such a tool available? That is very useful? For free? In KDiff3, you can do a diff/merge of entire directories. There is a hierarchical diff which is very accurate, user-friendly and clear. I was interested in finding a similar solution, however instead of directory hierarchy, an XML element hierarchy. If there is no such open source software, I am considering creating one on CodePlex to provide this functionality. KDiff3 is not XML specific, but it is free. It does a nice job of comparing and merging text files. Have a look at at File comparison tools, from which I am using WinMerge. 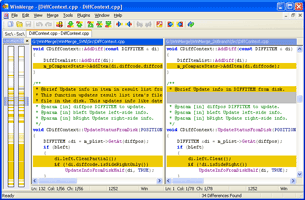 It has an ability to compare XML documents (you may with to enable DisplayXMLFiles prefilter). DisplayXMLFiles.dll - This plugin pretty-prints XML files nicely by inserting tabs and line breaks. This is useful for XML files that do not have line returns in convenient locations. EDIT: Updated link to my feature comparison table. I realise this thread is a little old, and I'm sure you've found a solution by now, but for future readers, I wrote and released a Windows application that specifically solves the problem of comparing and merging XML files. 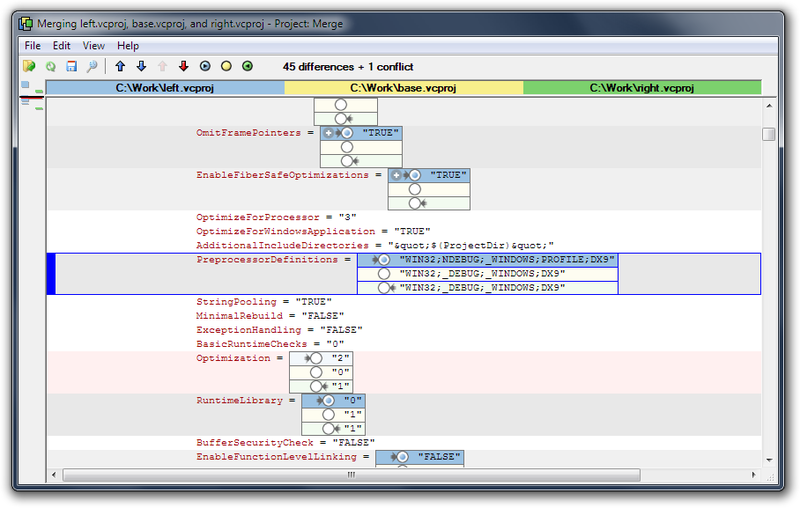 Project: Merge can perform two and three way comparisons and merges of any XML file (where two of the files are considered to be independent revisions of a common base file). You can instruct it to identify elements within the input files by attribute values, or the content of child elements, among other things. It is fully controllable via the command line and can also generate text reports containing the differences between the files. While this is not a GUI tool, my quick tests indicated that diffxml has some promise. The author appears to have thought about the complexities of representing diffs for nested elements in a standardized way (his DUL - Delta Update Language specification). Installing and running his tools, I can say that the raw text output is quite clear and concise. It doesn't offer the same degree of immediate apprehension as a GUI tool, but given that the output is standardized as DUL, perhaps you would be able to take that and build a tool to generate a visual representation. I'd certainly love to see one. The author's "links" section does reference a few other XML differencing tools, but as you mentioned in your post, they're all proprietary. Pretty Diff tool was created with XML in mind. Just ensure you click the option for "markup". I recommend you to use CodeCompare tool. It supports native highlighting of XML-data and it can be a good solution for your task. Not the answer you're looking for? Browse other questions tagged xml merge diff or ask your own question. XSLT to sort nodes by name? How can I merge XML files? Is there a way to manage changes to an irregular XML document like there is with DataTable? After modifying an xml file and save it, changes &quot; to "
What's the best visual merge tool for Git? Any decent text diff/merge engine for .NET? Are there any merge tools for source control that understand code? Is there any way to merge in a visual merge tool on windows that simultaneously shows annotations? Is there a tool for reformatting an XML file so that there are two attributes on a line? How to perform a three-way diff in Git without merging?